Company description: Produces bags with 10 compartments that distribute weight evenly between the front and the back of the wearer’s body. 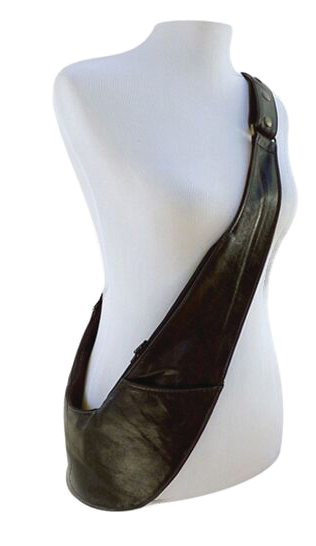 The black leather sash bag is the company’s best-seller. Now, in its sixth year, Sash Group Inc., which has ten employees and has a fulfillment center in Canada with manufacturing done in India, is expanding into two more factories in China and is projected to sell 70,000 bags and hit $7 million in sales this year. San Diego  Eight years ago, Nichole MacDonald, founder and chief bag lady of San Diego-based Sash Group Inc., found herself homeless with her then 5-year-old son after her recycled, eco-friendly bag business, Bagonia, failed to get off the ground. Two years later, she got the idea for a new design: a bag that hugged the body — much like a pageant queen sash — and had enough compartments to hold the essentials, and distributed weight across the front and the back of the wearer’s torso. In the fall of 2012, after having a friend hand-sew a prototype, wearing it out and getting three inquiries on it the same night, she officially launched the sash bag. With the help of a Kickstarter campaign in spring 2016, which raised $81,000, and $300,000 in investment money from San Diego-based life coach, Liz Stone, the company went from $350,000 in revenue in 2015 to $1.2 million in 2016. Last year, Sash Group Inc., headquartered in Hillcrest, sold 30,000 bags and made $2.8 million in revenue. Most recently, MacDonald credits the sash sisterhood, a group of sash bag fanatics from around the world, which she has connected with personally via a private Facebook page started in mid-2017, for helping take the business to the next level. In June, after receiving multiple requests for a larger version of the sash bag, MacDonald turned to Kickstarter again. In the first 36 minutes, solely from women in her Facebook group, some of whom own up to 30 sash bags themselves, MacDonald raised $29,000. As of press time, the campaign had raised $333,752 from 1,831 backers.